As a customer of Northwest Mechanical, you have access to our 24 hour / 7 days a week service center. Any time, any day, you can call us and we will troubleshoot your problem and resolve it quickly. We have licensed plumbers and solar experts on staff. If you have an older solar system, call on us to inspect, update, modify, repair or replace your system. Typically, replacing an old roof requires the removal of existing solar power systems. NW Mechanical coordinates with the roofer, safely removes your solar panels or collectors, shuts-down the system during the roofing project, and then professionally re-installs everything after the roofer is done. Do you have a solar system that “came with the house”? Call us to evaluate the system to determine whether it is worth fixing or replacing. Poor Results? Trees Overgrowing? Need Troubleshooting? Older solar energy systems that were installed 20-30 years ago may still be fully operational yet give poor results. Why? In many cases, trees that were small or not-yet-planted have grown to a size that now blocks solar access. Other causes may be holding back the performance of your solar system. Some times it is a simple fix and you can be on your way to greater results. Contact us to evaluate your system and site to determine what can be done to improve your system’s output. Whatever the problem, Northwest Mechanical's Solar Engineering Maintenance team can get to the root of it -- and get your solar systems performing in top condition again. 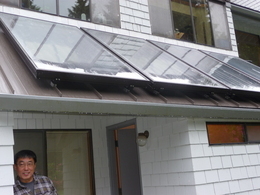 Have a question about solar energy, solar service, or looking for top quality solar panels Seattle can count on? Look to NW Mechanical for all your solar needs! "You all do an excellent job."